Biologists from state, federal, and provincial agencies conduct surveys each year to determine the status of populations, evaluate habitat conditions, and to estimate harvest. 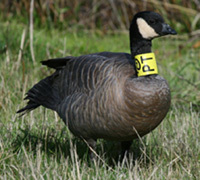 Banding programs are used to estimate survival and migration patterns. Surveys and banding programs are typically collaborative efforts among agencies, but agencies also conduct independent surveys and banding programs to meet agency-specific needs. Data are used cooperatively to manage migratory game birds and play a paramount role in the annual establishment of hunting regulations. Far too many surveys of migratory game birds exist to mention here, but a few of the larger, coordinated surveys are mentioned below. 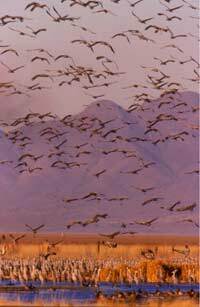 Reports from some surveys are available on the Division of Migratory Bird Management website of the U.S. Fish and Wildlife Service. Most migratory bird populations are monitored through the cooperative efforts of biologists from state, federal, and provincial agencies. Many of these surveys are referenced in species, subspecies, and population-specific management plans for the Pacific Flyway. One of the more notable national surveys for webless migratory game birds is the Mourning Dove Call-count Survey. 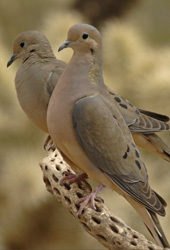 The Service developed the survey to provide an annual index to the size of mourning dove populations by state and management unit in the United States. The survey includes more than 1,000 randomly selected routes, stratified by physiographic region. The total number of doves heard on each route is used to produce an index to breeding population size and determine trends in populations. Breeding duck population size and production are estimated annually during the Waterfowl Breeding Population and Habitat Survey, which is conducted in May, and the Waterfowl Production and Habitat Survey, which is conducted in July. These surveys are conducted using fixed-wing aircraft and encompass principal breeding areas of North America, and cover more than 2.0 million square miles. The traditional survey area comprises 52 sampling areas across Alaska, Canada, and the north-central U.S. and includes approximately 1.3 million square miles. The eastern survey area includes parts of Ontario, Quebec, Labrador, Newfoundland, Nova Scotia, Prince Edward Island, New Brunswick, New York, and Maine, an area of approximately 0.7 million square miles. The U.S. 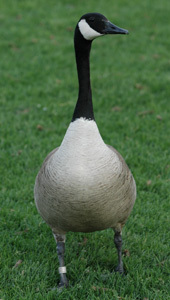 Fish and Wildlife Service and Canadian Wildlife Service coordinate assessments of the population status and productivity of populations of Canada geese, brant, snow geese, Ross’s geese, emperor geese, white-fronted geese, tundra swans, and other migratory birds in North America. Biologists from state and federal agencies annually conduct the Midwinter Waterfowl Survey to provide a measure of the relative numbers or trends of duck populations. The survey identifies winter waterfowl distribution and habitat use throughout the United States. The survey also provides estimates of the size of goose and swan populations and tracks population trends of duck species that nest outside of breeding survey areas. The North American Breeding Bird Survey (BBS) is conducted annually to monitor the status and trends of all North American bird populations. Following a rigorous protocol, BBS data are collected by thousands of dedicated participants along thousands of randomly established roadside routes throughout the continent. Professional BBS coordinators and data managers work closely with researchers and statisticians to compile and deliver these population data and population trend analyses on more than 400 bird species, for use by conservation managers, scientists, and the general public. In addition to these continental and regional surveys, many local areas, including federal wildlife refuges, state wildlife areas, and private conservation areas, are monitored to determine the status of breeding and wintering migratory bird populations. Primary continental waterfowl habitats are monitored during the Waterfowl Breeding Population and Habitat Survey in May and the Waterfowl Production and Habitat Survey in July. Biologists from federal, provincial, and state agencies survey areas via fixed- wing aircraft to evaluate the conditions of habitats in the north-central United States and southern Canada. In addition, many regional and local surveys are conducted to assess the condition and productivity of particular wildlife areas. Two nationally coordinated surveys document harvest of migratory game birds in the United States during the general season in fall and winter: the Migratory Bird Harvest Information Program (HIP), and the Parts Collection Survey (PCS). Both surveys depend on collaboration of the U.S. Fish and Wildlife Service with State wildlife agencies and support by migratory bird hunters. 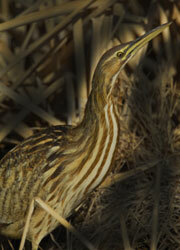 The HIP generates estimates of hunter participation and harvest. Hunters are required to register for HIP before hunting swans, geese, ducks, coots, gallinules, doves, band-tailed pigeons, woodcock, rails, snipe, and sandhill cranes. Annual estimates of hunter participation and harvest are based on a voluntary survey of selected migratory game bird hunters. The PCS provides estimates of the composition of the harvest. A sample of hunters from the HIP are provided special, preaddressed envelopes and asked to mail in the wings (ducks, doves, pigeons) or tail feathers (geese) of migratory game birds they shoot during the general hunting season. Biologists meet annually at an event called a wingbee to determine the species, age, and gender of the parts submitted by hunters. There is one annual wingbee in each of the four flyways. 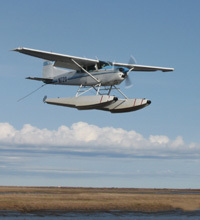 A third coordinated survey documents harvest of migratory birds in Alaska during the spring-summer subsistence season: the Harvest Assessment Program (HAP). This survey also provides estimates of migratory bird harvest during the general season in fall and winter in remote communities in Alaska. The HAP is based on household in-person interviews and it is conducted in collaboration among the U.S. Fish and Wildlife Service, Alaska Department of Fish and Game, and Alaska Native local and regional partners through the Alaska Migratory Bird Co-management Council. Bird banding is a universal technique for studying the movement, survival, and behavior of birds, and is coordinated through the North American Bird Banding Program. The program is jointly administered by the U.S. Geological Survey through the Bird Banding Laboratory and the Canadian Wildlife Service through the Bird Banding Office. These two offices do not band birds directly, but instead issue banding permits, provide bands, maintain band and recovery data, and coordinate banding projects in North America. The program supports banding studies of federal and state wildlife agencies, the academic community, professional and amateur ornithologists, and nongovernmental organizations. The banding process involves capturing wild birds and marking them with a uniquely numbered leg band. The bander records the band number, date, and location of banding, the birds age and gender, and other information, and sends that information to the Bird Banding Laboratory. Information from bands subsequently found are reported to the Bird Banding Laboratory. Banders may then learn about the characteristics of individuals and populations including movement, lifespan, survival, and other parameters. Many research projects on migratory game birds also involve marking birds with color leg bands, neck collars, radios, and other auxiliary markers. Such marking, also coordinated by the North American Bird Banding Program, provides more detailed data on individual birds through their annual travels. Write to the Bird Banding Laboratory (12100 Beech Forest Road, Laurel, MD 20708-4037) and report the band number, how, when, and where the bird or band was found. Contact your local state wildlife agency. 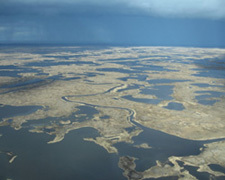 Photo credits: mourning doves, G. Andejko; float plane, T. Sanders; Yukon Kuskokwim Delta landscape, T. Sanders; American bittern, G. Andrejko; sandhill cranes, G. Andrejko; neckbanded cackling Canada goose, Andre Breault; legbanded western Canada goose, T. Sanders.